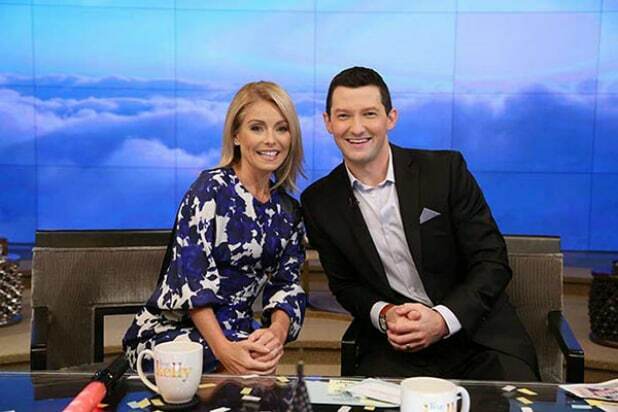 Richard Curtis and Kelly Ripa on "Live"
Could “Live With Kelly and You” contest winner Richard Curtis have a real shot at landing the permanent gig? Well, by mid-December, he’ll have guest co-hosted the talk show five times, so, maybe. Kelly Ripa will welcome the schoolteacher back on Monday, December 12, ABC revealed on Thursday. He’ll stay through Wednesday, Dec. 14. The following day, CNN’s Van Jones will take his turn on Michael Strahan’s former chair. On Friday, actor and Ripa’s husband Mark Consuelos returns to the temporary gig. Nepotism. “Live with Kelly” is distributed in national syndication by Disney|ABC Home Entertainment and TV Distribution. The show is produced by WABC-TV in New York and executive produced by Michael Gelman and Ripa.